During fiscal 2018, the No. 2 department store chain used its prodigious free cash flow to pay down debt. Kohl's (NYSE:KSS) entered 2018 with a solid balance sheet, especially compared to most of its competitors. It had $2.8 billion of debt and $1.7 billion of capital lease obligations, offset by $1.3 billion of cash. This has allowed it to maintain a solid leverage ratio, with adjusted debt of approximately 2.5 times earnings before interest, taxes, depreciation, amortization, and rent (EBITDAR). That in turn has won Kohl's investment-grade ratings from all of the major ratings agencies. Nevertheless, Kohl's has made debt reduction a key priority over the past year. As a result, Kohl's will enter fiscal 2019 with a pristine balance sheet, potentially allowing it to start devoting more of its cash flow to dividends and share buybacks. Kohl's has dramatically reduced its debt during fiscal 2018. Image source: Kohl's. In April 2018, Kohl's announced a tender offer to repurchase $300 million of its outstanding debt using excess cash. Within less than two weeks, holders of the company's notes and debentures had tendered $722 million of debt. Due to this high interest, Kohl's decided to increase the size of its tender offer, ultimately repurchasing $500 million of debt. During the second quarter, Kohl's continued its debt-reduction activity by repurchasing $28 million of its debt on the open market. Meanwhile, the company's capital lease obligations are declining steadily as it makes payments. 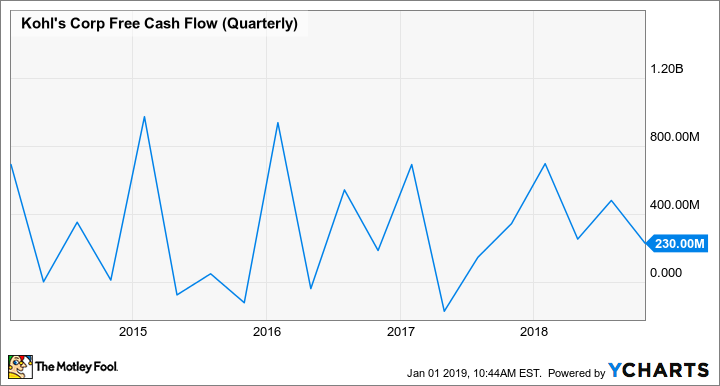 Kohl's Free Cash Flow (Quarterly), data by YCharts. Given that Kohl's planned to spend just $350 million to $400 million on share buybacks in fiscal 2018 -- and most of those repurchases were completed in the first three quarters -- it was clear by November that Kohl's would be able to reduce its debt even further by the end of the fiscal year. Two weeks ago, Kohl's notified holders of its 4% notes maturing on Nov. 1, 2021, that it would exercise its option to redeem them early. Kohl's initially issued $650 million of the 2021 notes, but it already repurchased some of them in conjunction with the April tender offer. This reduced the outstanding principal balance to $413 million. Kohl's is set to pay off the remaining $413 million on Jan. 24, probably at a modest premium to par. This move -- along with the company's capital lease payments -- will reduce its total debt and capital lease obligations to just under $3.5 billion by the end of the fiscal year. Additionally, by redeeming this debt, Kohl's will push its first maturity out to 2023. Kohl's leverage ratio has improved significantly during fiscal 2018, thanks to management's focus on debt reduction. The company will likely end the year with a leverage ratio of around 2.2 times EBITDAR, a level last seen in fiscal 2012. If Kohl's also reports strong earnings results for the fourth quarter and provides a solid outlook for fiscal 2019, the improvement in its balance sheet over the past year should win it multiple credit rating upgrades. That ought to give management the confidence to begin returning more of the company's free cash flow to shareholders. As a result, Kohl's investors could soon benefit from a rising tide of dividends and share buybacks.